A while ago, I noticed that one of our competitors uses OpenSearch to provide quick, easy integration with the browser. You see, any page that implements this specification will automatically show up in browsers such as Mozilla Firefox v2+ and Internet Explorer 7 (see the screenshot). Searching social data from the browser is very powerful because it encourages adoption. If a search doesn't return the expected results, all a user has to do, is change the search engine in the browser and re-submit. Easy. Simple. Not to be outdone, I decided to read the specification and see how complicated it would be to add this to Lotus Connections. Each file looks roughly like this. If you want to use them on your deployment, simply change the host name as shown in the screenshot below. 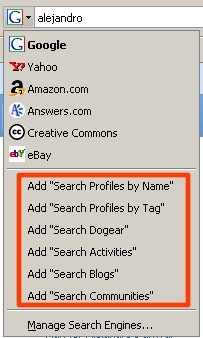 If you want to add more, simply do the search you want to provide and then copy the URL format to the template section. That's left as an exercise to the reader... . For now, follow these simple steps and you can start searching across Lotus Connections from your browser! !